Even my husband doesn’t know . . . well, I suppose he does now. Every morning when I leave my bedroom, music greets me and pulls me down the hall and into my son’s room. There, I stare at the radio, its soft alarm light blinking at nobody, singing to an empty room. On the bed lies the black bow tie I rushed all over town to find for him to wear at high school graduation (please, not a clip-on, Mom). 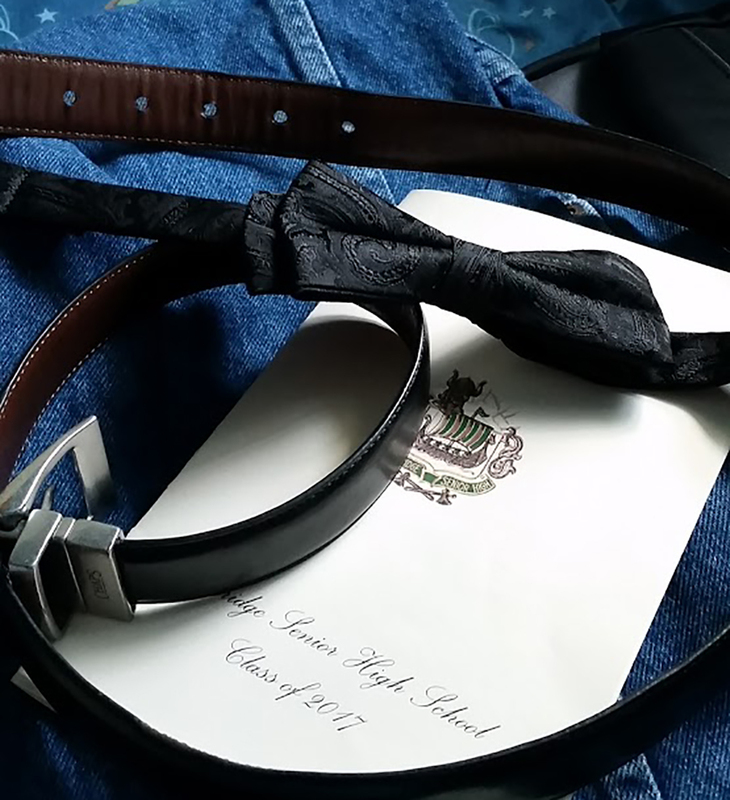 Now it’s been left behind with his dress belt in a heap atop the ceremony program, reminding me he didn’t even stay home for ONE night after graduation day. A now-familiar lump builds in my throat and I find myself sobbing. Again. Am I actually crying over an empty nest? How can that be, when I looked forward to this so eagerly after 32 years of having sons in the home? Why all these tears when I’m so genuinely proud of this young man and the path he’s chosen? He’s ready. I thought I was as well. Yet, I can’t put my finger on this mysterious pain. Sure, I’ll miss him. I miss his older brother, who’s been on his own for many years. But that’s not it. We’re supposed to miss them. Perhaps part of my confusion stems from the volume of personal items he left behind, taking only what he needs for his summer counselling job at scout camp. 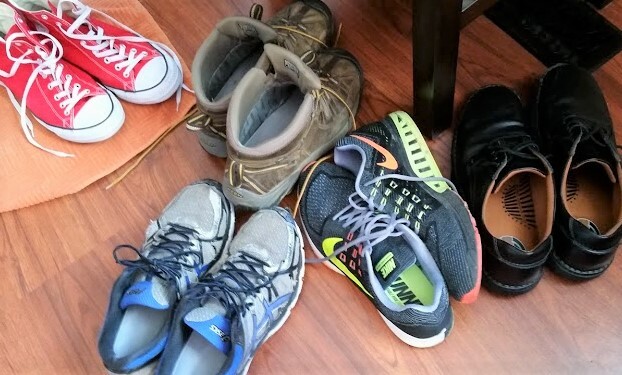 The numerous pairs of size-14 shoes take up a lot of space and make the room seem lived-in. A haphazard collection of books and coins lies scattered around the room, and there are clothes in the laundry basket. The entire picture seems to whisper, “I’ll be back,” as if the door will open any moment and he will nudge me aside with a sheepish apology for forgetting to turn off the alarm setting. He knows I can’t work this technology stuff. There was a day when I could do anything. Bring storybook characters to life, locate missing socks, rescue crumpled homework from the bottom of the backpack, bring home the right flavor PopTarts. He’d look at me with such joy, making me feel like a superhero. My primary job was to be there when he needed me. I keep going back to that silk bow tie, which I pick up and caress idly. With a fresh wave of tears, I finally identify my pain. It started with this tie, the day before graduation. I recall my frantic scramble to one sold-out store after another, mumbling to myself. He might have mentioned this more than a day before the ceremony. He has a perfectly good clip-on at home. If there aren’t any to be found, he can borrow one of his father’s long ties. All of these musings were true, and if I’d suggested any of them he would have nodded and found his own tie, because he’s easy-going that way. To be honest, he really didn’t ask for the tie. He just hinted that he preferred to tie his own. Clip-ons are for cheaters. But in my heart, I had a mission. He needed me one more time.
. . . which is how I ended up at the tuxedo rental store buying, not just a bow tie, but a silk one. An act of desperate love that has already been forgotten. A silk token lying in a pile of cast offs. It’s both a joyous and a painful realization. His father and I have trained him up the way he should go, and now we’re reaping the consequences. He’s got this. In fact, all I can really do for him now is pray, send the occasional care package, and turn off the alarm every morning. Of course, that third item wouldn’t be necessary if someone were to switch off his program settings. Heaven help the person who does that.